There is a house near Coffeyville KS that is supposedly haunted. I went out there with a group of friends. We took several pictures. 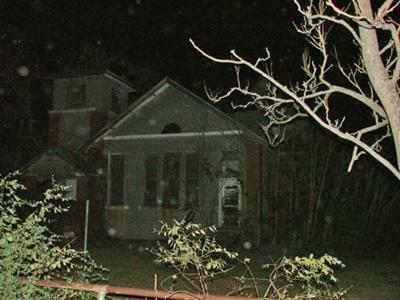 At first I was intrigued with all the Orbs that appeared in this picture, but in looking closer at it, we noticed a face in the top of the middle window. I took 3 pictures in succession. This second one is the only one with 'orbs'. I paused about 3-5 seconds between pictures. I did not change the angle of my camera or move. However, in the third photograph I took, the face seems to have turned toward us. I can't upload more than one photo - I'd like to post them both together. This is the 3rd photo that was taken. The 'ghost' in the upper part of the middle window appears to have turned toward the camera. In addition, there appears to be a young girl in the bottom right of the window. The 'orbs' are not in this photo. I have circled the two faces. I took this photos with a Fujifilm Finepix S5000. Quality was set on 1M with ISO 200. The two pictures were taken within 3-5 seconds of each other. I took the pictures from the same spot, having not changed my position or angle. "Orbs" are most commonly seen in pictures that either have dust on the lens or snow/dust particles in the air, or from reflections of other lighting sources and/or camera flashes. Since the tree on the right has no leaves, I'm assuming its fall early winter and the "orbs" are nothing more than light snowflakes or dust. As for the faces, I don't see them, even when zooming in on the pic. "The mind sees what the person wants it to see." I do not recall a basement in the school. I was a student at the school around 1964 until it closed down. I see the faces but it also looks like a face on the door. Hi. I am from Iran. I can't see any faces in this picture. Maybe the picture is not clear enough. Good luck. I have read all his info in 2008 at 11:27 pm he was 46 years old when his death came. He told his dad that he was going to a bar till 12:15 am with his friends. When he rode back home he saw an old man sitting on the road. He picked him up at 12:22 am about 15 min from home. The man said stop right here. Why? said Steve Edward. He looked at the man. But he was gone then Steve Edward died in his car with no problems at all. I used to work at this school house when it used to be a haunted house for halloween. It was sold to the people who live next to it and the reason why ur sposed to stay away is because the house is old and can fall in on you. I have investigated this house and it does seem like there is something in the windows, however the windows that you're looking into is the restroom and the kitchen area. It's hard to explain but nothing unusual has happened there, especially not when we worked there for over 6 years until it was sold. The legend is, that a school teacher, after closing the school down, hung herself in the bell tower and now her restless soul haunts the school house. Anyone else who is haunting the school house may have had some sort of emotional connection to the location. Hard to spot but when spotted, freaky. Please stay away from the Parker House. I have heard alot about it, and not everything is good. I have read all his info in 2008 at 11:27 pm he was 46 years old when his death came. He told his dad that he was going to a bar till 12:15 am with his friends. When he rode back home he saw an old man sitting on the road. He picked him up at 12:22 am about 15 min from home. The man said stop right here. Why? said Steve Edward. He looked at the man. But he was gone then Steve Edward died in his car with no problems at all.here have been many unexplained happenings there. Thank you now someone sees what I've seen. This picture was taken with a Fujifilm Finepix S5000. The quality was set on 1M with ISO 200. 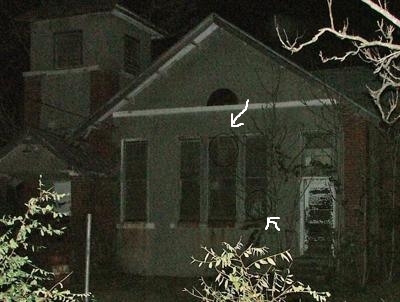 I have submitted the 2nd picture - titled Parker House 2 in which the face appears to have turned to the camera, the orbs have disappeared and the face of a young girls appears in the bottom right of the window. Thanks for the pic. To get your other photo posted, just make another submission. Call it Parker House #2 or something. I'll know it's you. I can put them together. By the way everyone, orb photos are not allowed without stating what type of camera they were taken with and the story behind the haunting. This is due to their controversial nature and the fact that it makes our visitors really cranky. So I did not accept your pic based on the orbs. I'm waiting to see this face in your pic. If you could circle it before uploading, that would be great. Also, go ahead and tell use the make/model of your camera so we've got all the rules covered.